When I first heard green chile and coconut in the same recipe, I was immediately intrigued. I couldn’t decide if the combination would be delicious or disgusting. There was only one way to find out. While all of my roommates hung out in the basement eating take-out and some delicious Lemon-Artichoke Hummus to avoid the heat of cooking in our boiling house, I was sweating in the kitchen. It wasn’t until I had already started cooking that I realized that curry is spicy and coconut goes great with that, which eased my nerves a bit. Man, am I happy that I gave this a chance. I love love love green chiles and this is just another delicious recipe to add to my green chile recipe index. The green chiles give the coconut milk a spicy kick, like curry would, but you don’t have to have that curry flavor. A lot of the time, I think of curry and am just not in the mood for that flavor, but now I can have a spicy coconut dish without having to use it! 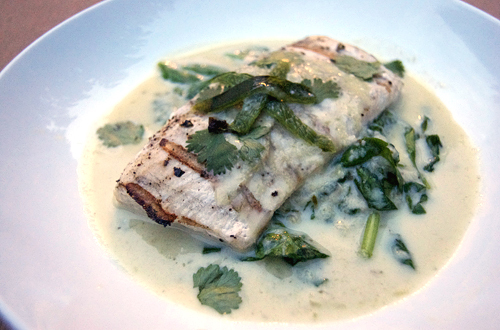 The creamy broth soaks into the fish so well too, giving it a rich and creamy flavor. Adding a bunch of spinach tops this recipe off and makes it even healthier! Heat a medium pot over medium heat, add oil and sauté the onions until soft (about 5 minutes). Add the garlic, cook for an additional minute or two, then add the wine and let reduce until almost dry. Next, add the coconut milk, poblano and chiles. Bring the pot to a boil, then add ½ cup spinach and let cook until wilted (about 1-2 minutes). Pour the mixture into a blender, add the water and blend until a sauce forms (about 2-3 minutes). Place the fish on the grill and cook until finished (about 4 minutes per side) season to taste with salt and pepper. Pour sauce over a bed of remaining spinach with cooked fish. Wow, coconut broth huh? I’ll bet that’s delicious. Probably better than the salmon I just smoked in maple syrup. I love coconut. I’ll try this one out for sure! Wow! Looks good. Coconut broth sounds tasty! This looks fantastic! I love mahi mahi and I love coconut. I love coconut milk. This sounds great. This sounds super yums! 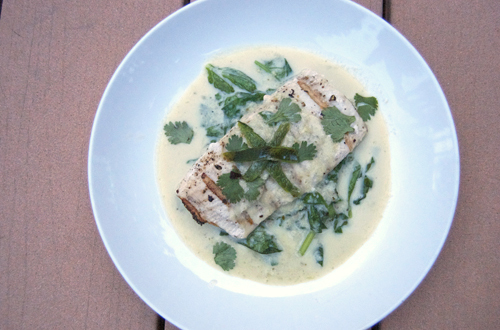 I love mahi mahi and the coconut chile broth I bet goes super well with it! Ah this sounds fantabulous!! This sounds like a perfect addition to my own ‘must make more fish’ weekly menu. Great looking dish. Sometimes I just really don’t fancy curry too but I still crave certain Asian flavours. Haven’t heard of coconut broth, thanks for sharing! This recipe looks fantastic, one I’ll be trying soon. I love the addition of the roasted poblano peppers. They’re a great pairing with coconut. Thanks! This dish looks so yummy and accessible as a recipe. I love that you included a print option for the recipe. That’s so convenient. Can’t wait to try this–I’ll let you know how it works out.